Eagerly awaiting the arrival of Santa. 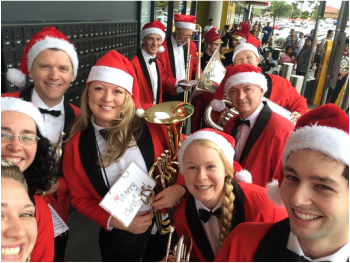 A welcome break between competition preparations, Holroyd Brass enjoyed the silly season, welcoming Santa to shopping centre’s across Western Sydney, throughout November and December. With so many parades, the band was kept very busy for many weekends! Santa hats and silly badges were donned, much to the delight of the waiting children. 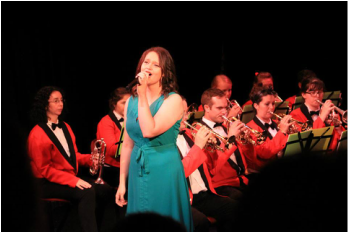 As part of our Christmas celebrations for 2014, Holroyd Brass spent many months in preparation with Packemin Productions to stage a christmas concert – ‘Festive Family Favorites’ – at the Riverside Theatre in December. Although it was a stormy day, that didn’t matter as the concert was a sellout! The theatre was filled with Mums, Dads, children and Grandparents, all there to see the band playing a fun selection of Christmas pieces. Dressing the part, the biggest crowd pleaser was Joel Gilberthorpe and his cheeky rendition of Frosty the Snowman on Trombone. Our collaboration was so successful, we are looking forward to working with both Packemin Productions and the Riverside Theatre on future concerts and shows.